This waterproof silicone sealant is the best overall glue for outdoor use. It works for all my garden art projects including dish flowers that stay outside, all year-round in a cold climate. 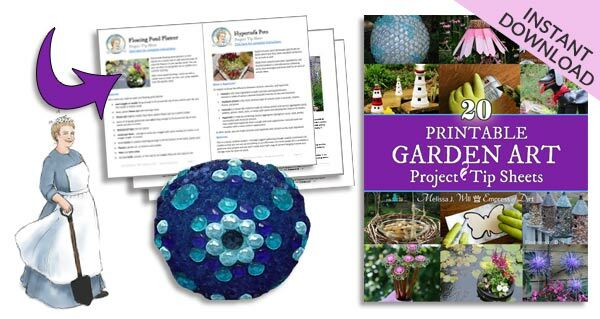 For more adhesive recommendations, also see the Glue Resource Guide for Garden Art Projects. I get a lot of emails from people having trouble making the flat marbles or other decorations on their garden art projects stick or adhere, so I’ve written up this page with my best tips and trouble-shooting information. I use GE Silicone II sealant for most of my garden art projects. It is called ‘sealant’ but for my projects it works as an adhesive for glass, wood, and metal. It’s not a paintable caulking and once it’s cured, it’s done. You cannot paint it or glue more things to it. But it does a fabulous job sticking stuff together permanently, holding up in crazy weather conditions. Check the Use By date, read the product label, store it as recommeneded (no extreme temperatures), and follow the user instructions. Keep in mind that it is permanent. You cannot remove it once it has dried, and you cannot apply more adhesive to an existing layer once it has dried. So work thoughtfully. It is sold in home improvement stores in the caulking section. You can buy it in a tube or a cartridge that uses a caulking gun. The cartridges are about half the cost of the tubes. I make garden art items that I leave outside, year-round, through the Canadian summer heat and winter wet and cold. I do not want to have to bring them indoors for half the year so I like a product that forms a strong, long-lasting bond. While there are other products that may work as well, I recommend this specific one because it always works for me. If you’re new to making garden art projects like garden balls , totems, garden treasure jars, and dish flowers, these tips should help you succeed. They are all easy projects but do require the right product and technique provided in the tips here as well as the project instructions on this site. I do not receive any compensation from GE for recommending this product – I just really like how it works – but the product links here are to my Amazon affiliates account. You have to willing to experiment and find what works best in your climate. If you have something you like better, use it. Before using any product, read the product label and follow the manufacturer’s health and safety guidelines. Most products like this one require working in a well-ventilated area. Know ahead of time how to clean up any leftover product, and how to remove it from your skin or eyes. If making a garden art project with children, only adults should handle the silicone sealant. As mentioned, GE Silicone II forms a permanent bond as soon as it dries and you cannot remove it so work thoughtfully-there’s no turning back. Use the right product. I am a fan of GE Silicone II sealant for most outdoor garden art projects. Make sure the product is fresh (check the Use By date on the container). Ensure that the product has not been stored in a hot or cold area. If it’s runny when you apply it, it’s not good and will not work. Make sure the surface of the globe or jar (or whatever you’re using as a base) is clean, dry, and grease-free. Apply the silicone sealant according to the project instructions. For most projects such as garden art balls and totems, apply it at least 1/4-inch thick. Press the flat marbles into the silicone sealant and allow it to smoosh around them. 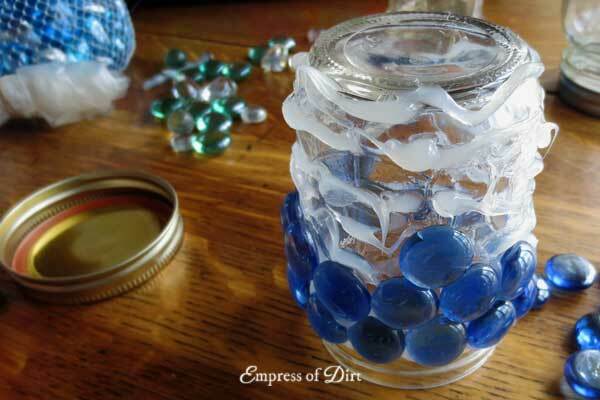 It will fill in the areas between the marbles appearing like an opaque grout. As it dries, it grabs the marbles, holding them in place. 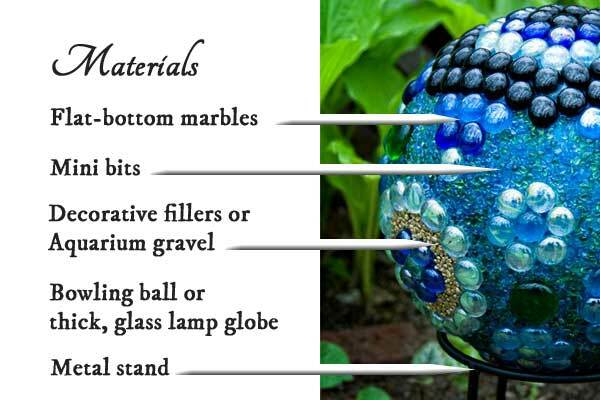 This tutorial shows how to make a decorative garden art ball. Make use of gravity. If your marbles are sliding off while you’re working, you may be working against gravity. Start at the lowest part of the base, applying one row at a time. The next row will sit on the one below and the marbles won’t shift while the silicone sealant is drying. Read the label carefully before you buy! There are so many different types of sealants and caulking…. 3-hour rain-ready and sun/freeze proof for use in gutter and flashing installations and repairs, that also provides mold-free product protection. Once cured (after 24 hours), is sun/freeze proof, meaning it won’t crack or crumble even when exposed to harsh weather such as extreme heat or freezing temperatures. Adheres to aluminum, stainless steel, wood, masonary, brick, concrete, painted surfaces, vinyl and plastic. Remove dirt, grease, and moisture before applying. Allow at least 3 hours before exposing caulk to water. Not for use below the water line (i.e. not to be submerged in water ongoing). My silicone sealant says ‘clear’ on the label but it’s not clear – is something wrong? No, you are correct. Even though they call it ‘clear-drying’, it does not dry clear, but instead has an opaque quality. If you want something that will truly dry clear, you may want to try other products. I don’t have any to recommend that I like. Plus, I don’t mind that the sealant is somewhat visible. Can I grout over silicone sealant? No. Nothing sticks to the dry sealant so it is not appropriate for grout or paint. If you want to do a mosaic project, you could carefully apply the sealant to the underside of the pieces only (without any oozing into the gaps), and then apply grout to the gaps. But keep in mind that if there’s any sealant showing, the grout will not stick there. I can’t complete the project all at once. Can I pause and finish later? Yes, BUT—first, make use of any adhesive you have already applied (add your marbles). 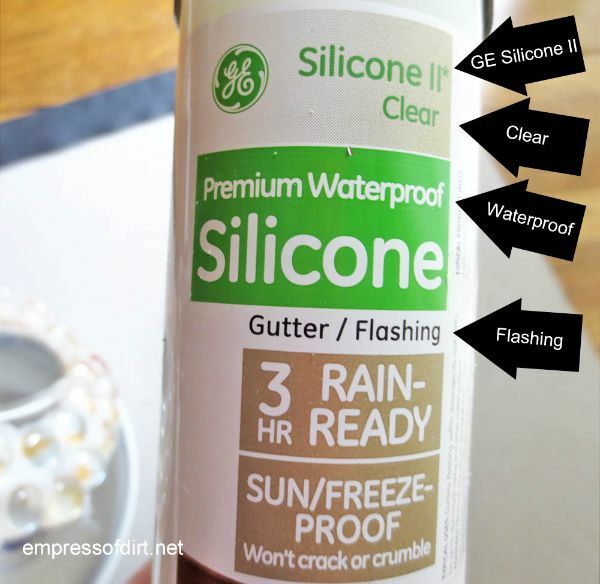 GE Silicone II is permanent: once it dries, you cannot remove it, you cannot add more adhesive on top of it (it will not stick), and it is nearly impossible to peel off. This is why I advise working in small sections: apply some adhesive, attach the marbles, do the next section. It works so nicely for garden art projects because it is permanent but this also means you have no second chances. My marbles are sliding off the globe! My marbles fell off! I get emails asking for help with adhesive problems and it usually comes down to one of the factors listed (above) in Tips To Be Sure The Adhesive Sticks. Are there any other products I can try? Yes. 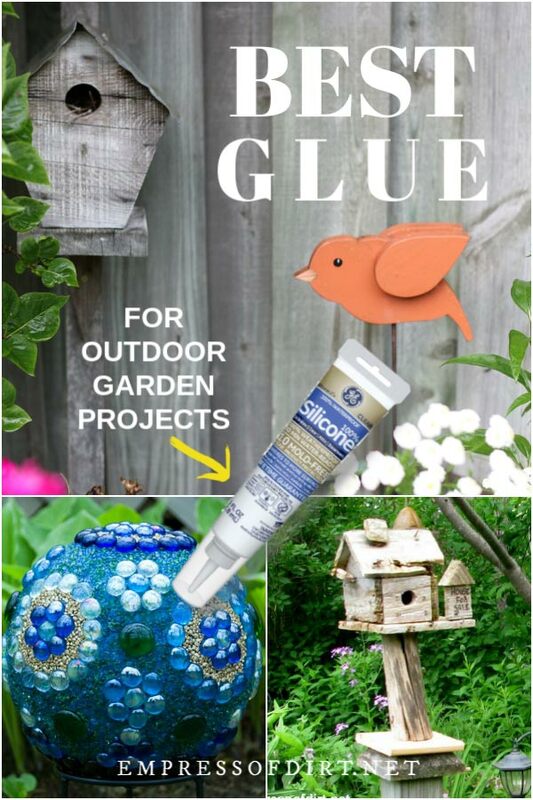 Have a look at this Glue Resource Guide for Garden Art Projects for more recommendations. People in really humid areas like Florida have a hard time keeping whatever product they use from becoming too warm. When adhesives and sealants get too warm, they separate into a gel-like liquid and that does not work properly. I have not had any problems with GE Silicone II here in Canada where we have cold winters and humid summers. I’ve been making glass garden art for 2 1/2 years now but after trying the GE Silicone II and not liking the look, frosted, I switched to DAP 3.0 which is crystal clear. it looks much better on the finished product and holds up well. I also leave mine out year round. Yes, it all depends how you apply it and if visibility matters. I’ve used DAP but the drawback is the price: I cannot find it in large tubes and it’s pricey as it is. 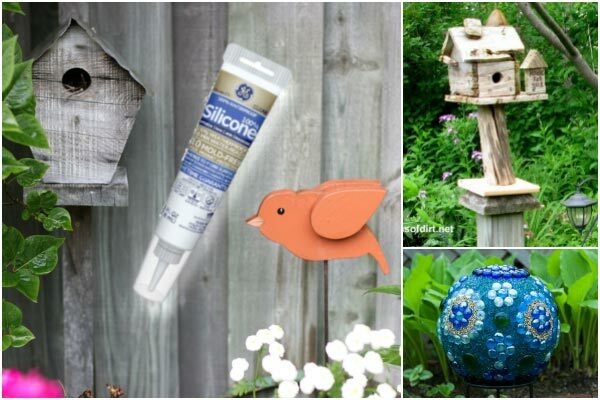 I have a glue guide here comparing various product options: https://empressofdirt.net/glue-outdoor-garden-art/ Thank, Gayle! I am in New Zealand and have started to make some glass plate flowers. I used your link to get a twin pack of GE Silicone recently. I went to replace my Ofer for more but it doesn’t seem to send to New Zealand this week. Any idea how I could purchase some more, or if we here in New Zealand have a tried and tested product that is the equivalent? Hi Leanne, I don’t know how you could get some. It’s 100% silicone so perhaps you can find some closer to home. I have a resale shop and so much beautiful glassware comes in our door that no one buys. So we have decided to do art with all this glass. Your tip will be put to good use. Thank you. You’re right—you have to use the adhesive once it is applied. Some people work carefully in small sections, others like me smoosh it on, let it spread, and apply whatever is going there asap. So, it all depends on your crafting style. You can get the adhesive in small tubes and that makes it easier to apply it stone by stone, and do the mini bits separately. I haven’t tested it for cement and peat moss so I don’t have an answer for that. Let me know if you try it. You are such an artist…!!! I cant wait to try an idea or two to dress up my chicken yard…!!! I do glass on glass mosaics and three years ago did several glass in concrete stepping stones. I used Silicone adhesive–though it wasn’t this type. Weather has caused pieces to come loose. Can this adhesive be used to replace the pieces? I live in the Pacific NW (Washington) so it’s mostly rain and not hard freezing temps. Hi Bob, The adhesive only bonds to a clean surface, not to existing adhesive, so you could only if the old adhesive was removed. That said, perhaps yours came loose because a) the surface is stepped on, and/or b) too much rain/sitting water. The product is not made for wear and tear (feet stepping on it) nor ongoing water exposure. It’s really just suitable for garden art decor like a totem made of stacked vases or attaching flat marbles to a plate. I do not know of a product to recommend for your project but I’m guessing mosaic makers would have suggestions. Just wondering if the GE II Silicone Sealant Product will work on attaching the flat bottom marbles to the outside of plastic hanging planter containers? (The kind you buy at gardening centres with flowers and plants already contained in them?) Thank you! Hi Monica, yes, it adheres to aluminum, stainless steel, wood, masonary, brick, concrete, painted surfaces, vinyl and plastic. I’m wanting to fix a birdbath but you say the GE Sealant is not good. Do you know of any brand that wwould work and not make the birds sick? Hi Carol, I do not know of one. GE Sealant itself is not intended for sitting water, so even if it was known to be harmless to animals, it would not be a good choice if there is constant water exposure. There are marine adhesives but I do not know of any that are specifically approved for animal safety. A workaround is to use a separate container to hold the water. I do this with a nice pottery dish that I found that fits the size of my bird bath. Can you use this and will it hold in temperatures above 100 for the full summer months? Hi Melody, Yes, it gets that hot where I live too. According to the product label, the silicone sealant is good from -51C to 204F, so yes!